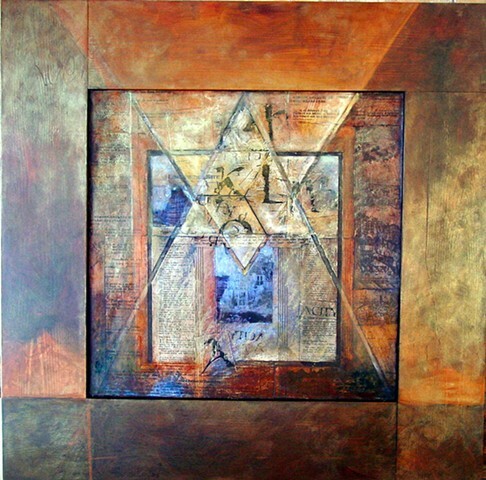 The incised intersecting triangles form the star of David. Jesus is called the Son of Man -- John 3:13 "No one has ascended into heaven except he who descended from heaven, the Son of Man." He is also called the Son of David -- Matthew 1:1 "The book of the genealogy of Jesus Christ, the son of David, the son of Abraham." The WORD made flesh alone brings heaven and earth together and unites all languages and words. Across the center is a quote by Malcolm Muggeridge. "Even with all our distractions and diversions we aren't satisfied. We never will be. We aren't supposed to be. God set it up this way on purpose. His plan is that frustration with the finite should shift our gaze toward home."